Posted by I've been on a healthy streak lately.. 2 posts on salads the past 2 months?! Because who the heck wants to eat healthy? Well, at least this one doesn't involve lettuce or kale of any sort lol, and its sneakily delicious! It involves a grain my boyfriend loves to eat (and loves to hate as its "healthy"), but its hard to not make it every now and then when its packed with fibre, protein, has a neat nutty flavor... and bonus to those that can't have gluten.. its naturally gluten free to boot. I've made this one over the years with a few tweaks here and there.. but its simply a salad that can be a meal bursting with Mediterranean flavors that remind me of a month long trip to Greece years ago. 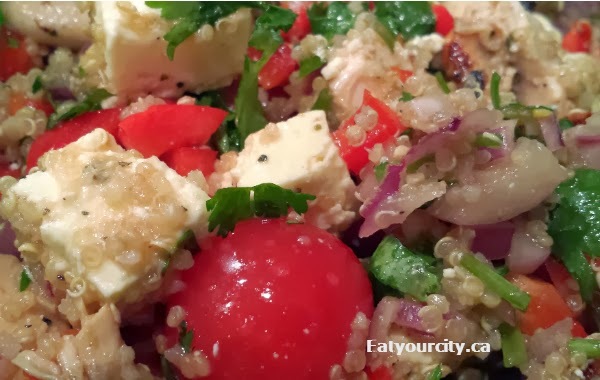 The key with this easy and tasty way to make quinoa.. is to make sure you taste the dressing and adjust if you need to. If you're using a random bottle of balsamic vinegar - they vary a lot both in terms of flavor and acidity ( I've used many different bottles and rands over the years trying to find a run of the mill bottle that works well for the kitchen and cooking.. not dipping). If using aged balsamic vinegars, you still need to adjust as while they tend to be more mellow, less harsh, and they also tend to be sweeter tasting. **optional: 2 cups left over roasted chicken- cut into bite size pieces. If serving as a salad, you can leave out the chicken, but adding it in makes this side salad a quick and easy dinner or lunch for the next day! 1) In a small pot, bring the chicken broth and garlic to boil, then add in quinoa. Give it a stir, then cover and simmer on low for 20minutes. Uncover, and fluff with a fork. Quinoa is done when it has little "white curly tails" appearing and is no longer hard in the centre. 2) In a large mixing bowl, whisk all the dressing ingredients together, then add the rest of the vegetable ingredients and roasted chicken if using as well as the quinoa. 3) Mix well. Adjust seasoning - salt, pepper if needed. Chill for an hour to overnight let the flavors blend, but you can eat it right away too. Enjoy! Ps - this rocks with addition of ripe creamy avocado chunks, marinated peppers/artichokes... its not traditional flavors, but super yummy!